Sharon L. Taylor, MD, was installed as president of the Pittsburgh Ophthalmology Society (POS) at the society’s annual meeting held March 17 at the Pittsburgh Marriott City Center. Dr. Taylor, who served as president-elect since 2015, is the second woman in its history to hold the position as president of the local society. She will serve a two-year term. Dr. Taylor earned her medical degree from Albany Medical College. She moved to Pittsburgh in 1989 where she completed a transitional year internship followed by ophthalmology residency at St Francis Medical Center. She joined North Park Ophthalmology, an independent comprehensive ophthalmology practice in McCandless Township, in 1993 and has been in full time practice ever since. Board certified by the American Board of Ophthalmology, Dr. Taylor participates in the board’s Maintenance of Certificate program. She has also been actively involved in the medical staff at UPMC Passavant Hospital throughout her career, serving in various positions including OR committee chair, division chief, and department chair. She was the medical director of Surgical Services from 2008 to 2014 and is currently physician advisor for Surgical Quality at the hospital. Dr. Taylor has been an active member of the POS since 1990. She served as program director for the society’s Annual Meeting for Ophthalmic Personnel from 2009 to 2015. 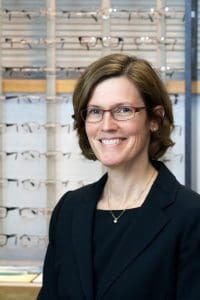 She is a founding member of the Thorpe Circle, which was established in 2014 to help offset the costs associated with the annual meeting so that the society could continue to invite the best and brightest lecturers in the field of ophthalmology to the Pittsburgh area. Dr. Taylor began serving on the board of the Pennsylvania Academy of Ophthalmology in 2016 as an alternate councilor to the American Academy of Ophthalmology (AAO). She will be attending the 2017 AAO Advocacy Day and Mid-Year Forum Council meetings this April in Washington, D.C.
Dr. Taylor and her husband, Phil Rabinowitz, MD, senior medical director, Cigna Healthcare, reside in McCandless. They have two children. Their son is a graduate of Case Western Reserve University and will be attending medical school there this summer. Their daughter lives in California and works as an analyst for a local company and is also a freelance judge for Magic the Gathering. In her spare time, Dr. Taylor enjoys listening to and performing live music, traveling, art, spending time with her family and friends, and a variety of fitness activities including hiking, skiing, yoga, and swimming. Dr. Taylor is an avid flautist.